Chairman Tony Hewitt says Saints are still in the market for signings for next season. 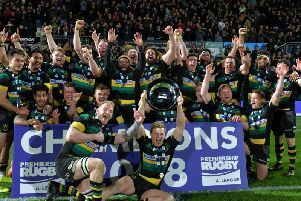 Plenty of Premiership clubs have been revealing deals in recent weeks, with the likes of Leicester and Wasps strengthening for the 2016/17 campaign and beyond. That has prompted Saints fans to wonder whether their club will be adding more fresh faces in the coming weeks. And when asked that question, Hewitt said: “We’re still very much in the market for next season, trying to recruit players in certain positions. Saints have already secured a marquee signing of their own, with France star Louis Picamoles heading to the Gardens this summer. The capture of the Toulouse No.8, which was announced back in November, is a sizeable coup for Northampton. And Hewitt said: “We’re excited that we’ve got Louis Picamoles coming here. He’s a major world-class player coming in. “That was fantastic because there was a lot of pressure on that with other clubs. “We’re delighted to have got that done and he’s someone with more than 50 caps for France. It’s great to have a French player coming into England at that level.